Ok, I am just minding my business with the family and the walls start shaking and shaking. That was one of the strongest and longest quakes that I have felt in San Diego in a very long time. No damage here except for the Internet getting knocked out for a few minutes. 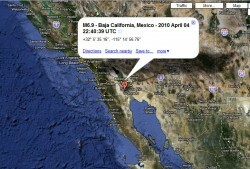 A quick search showed a 6.9 magnitude quake in Baja California at 3:40 pm Pacific. A google map of the location can be found here. Since then an aftershock has hit and a couple of smaller quakes in northern California.